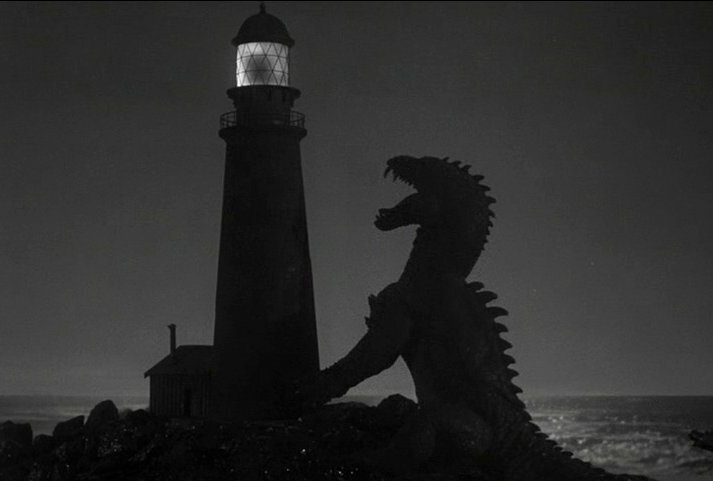 The Beast from 20,000 Fathoms (1953). This is about the day Jean Renoir watched The Beast from 20,000 Fathoms. I’m not making this part up. He went to a matinee. To repeat: Jean Renoir—a giant among film artists, director of The Rules of the Game (cited by some sophisticated and astute people as the greatest film ever made) and other masterpieces, ranked as the fourth greatest director of all time in the 2002 BFI Sight and Sound poll, son of the famed impressionist painter Pierre-Auguste Renoir—had a grand time at a matinee in summer 1953 watching The Beast from 20,000 Fathoms accompanied by Eugene Lourié, the movie’s director. I’d give anything for a photo of Jean Renoir and Eugene Lourié in that movie theater, surrounded by a happy sea of monster-loving children and thrill-seeking adults, enjoying the first of the 1950s cycle of giant-monster-attacking-a-city movies. According to Lourié, it made Renoir feel like a kid again. Monster movies have a way of doing that. Apparently, even the most sensitive and compassionate of directors can enjoy an afternoon of popcorn, rampaging dinosaurs, and urban mayhem. It’s good for the soul. This is my second contribution to the Top 100 Science Fiction Countdown at Wonders in the Dark. There’s a little hint at the end regarding what my third contribution will be. Enjoy! While Invaders from Mars enjoyed some popularity upon release in 1953, its real impact came when the movie was released to television in the late 1950s. Although it inevitably lost the power of its weird Cinecolor process and its depth of field, it strangely gained in resonance as well. In their comfortable suburban homes, boys could watch the story of a boy who looked out the window of his suburban home. And there was a curious leveling of the image in those old TVs—low budget science fiction came out looking eerily similar to the 6:00 news. I think I must have seen Invaders from Mars for the first time between 1965 and 1970 (when I was five to ten), probably on a Saturday afternoon. Although I watched it approximately 15 years after the movie was made, the movie’s main protagonist—a preadolescent boy—could have easily been a neighbor on my block. His bed looked like mine, his telescope looked like mine, and his window looked like mine. I could easily imagine rising from bed at 4 a.m. and looking out my window to see a UFO descending. This key scene was grounded in my reality. For a suburban 60s kid, it felt archetypal. I contributed this piece to the Top 100 Science Fiction Countdown at Wonders in the Dark. For the next three months, Wonders blogmaster Sam Juliano will be sharing 100 essays on these great films, written by dozens of his knowledgeable film-buff friends. It’s an honor to be counted among them! Bobby Henrey in The Fallen Idol (1948). Sometimes as adults, we forget how lonely and confusing childhood can be. 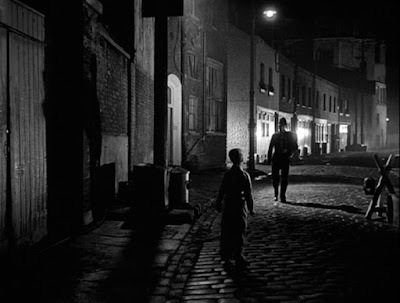 Produced in England in 1948, The Fallen Idol (1948) resonates long after its final scene for its moving central depiction of vulnerability and helplessness. Fade in on Bobby Henrey as Phillipe, an inquisitive-looking boy peering through a second-floor railing, watching the clockwork precision of the embassy staff below. Everyone has a job to do but him. In his privileged position as the diplomat’s son, Phillipe is simply an observer, like a child in a movie theater (or, more pessimistically, like a prisoner behind bars). Being so young, nine-years-old at the most, he watches intently but probably understands only a fraction of what he sees. I contributed this piece to the Childhood Films Countdown at Wonders in the Dark. Wonders ringleader and mastermind Sam Juliano has organized dozens of his knowledgeable film-buff friends to write in-depth essays on 80 great films that explore childhood and adolescence. It is an honor to be participating! 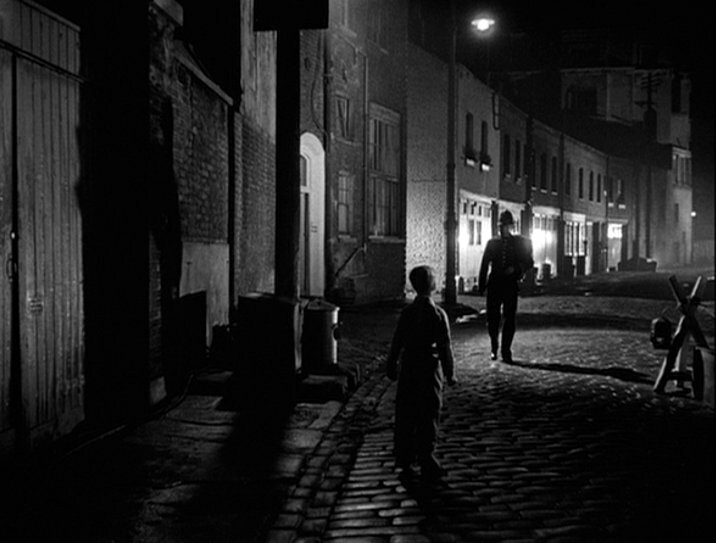 Skip on over to Wonders in the Dark to read my whole piece on Carol Reed’s The Fallen Idol (1948). Meanwhile, here at 21 Essays, I’ll just tease with some tasty images from the film, a favorite of mine for many years. atmosphere of the city at night. as he filmed the streets and sewers of post-war Vienna. 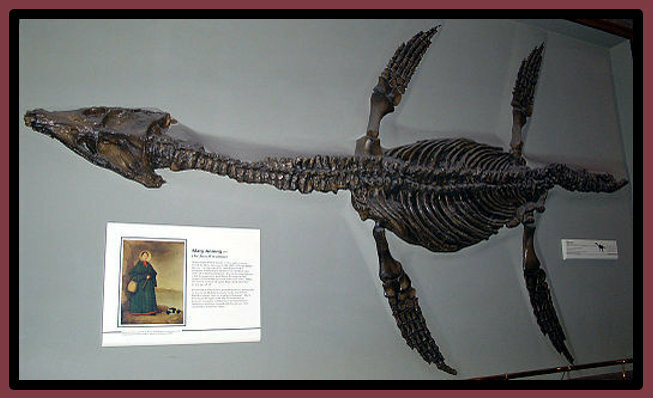 Icthyosaurus skull found by Mary and Joseph Anning in 1811. There aren’t many testaments to the achievements of 19th century women in the British Museum. In those days, the British Royal Society and its offshoots acted as gatekeepers for recognizing scientific achievement, with their memberships strictly closed to women and lower-class riff-raff. Science and exploration were activities reserved for gentlemen. So who let Mary Anning in? In gender-suppressing, class-conscious early 19th century England, Mary Anning forced her way into the museums and science books by sheer genius of observation. 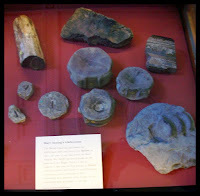 Better-educated men trolled the countryside for fossils, but lower-class, under-educated Mary ran circles around them. She was so good they eventually had to take notice. While preparing for our London vacation, a friend had advised me to check out the rather drably titled Enlightenment Gallery at the British Museum. It’s where the museum displays many of the original collections gathered during its early years, imposingly displayed in the King’s Library (which really WAS home to the King’s Library, being George III’s collection donated to the British Museum by George IV). Row after row of display cases stand as silent testimony to England’s greatest scientists and explorers when the Empire was at its peak. 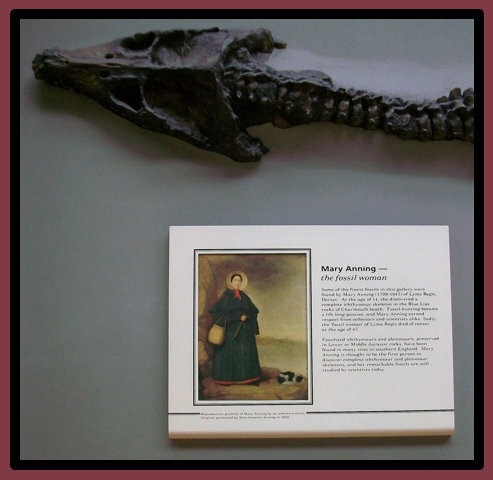 I settled in to pay my respects at the Mary Anning display case. Raised in a poor family that earned a little extra cash each summer by selling fossils to tourists visiting Lyme Regis, Mary was just 12 years old when she and her brother Joseph made their first great discovery—a remarkably intact fossilized icthyosaur skeleton from the long-ago Jurassic world. 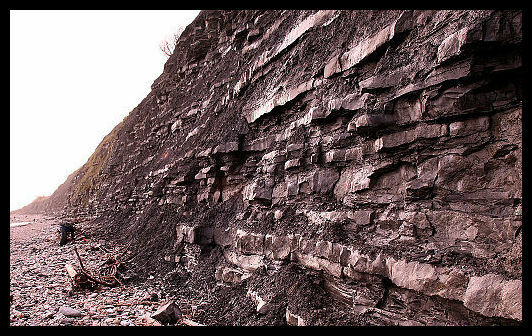 At a time when would-be amateur geologists and paleontologists were scouring England for prize specimens, Mary Anning nurtured a talent for finding the very finest pieces. Although lacking formal education, she intuitively grasped the biology of the strange animals that she discovered along the limestone and shale cliffs that lined the Lyme Regis coast. 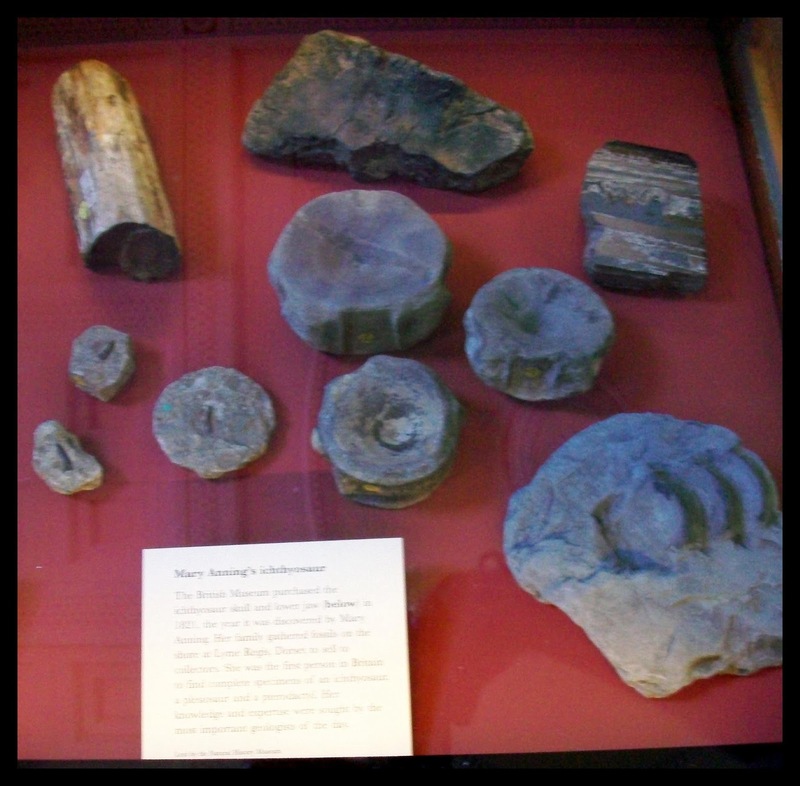 Several days later at the Natural History Museum, I enjoyed seeing fossils associated with prominent and respected Victorian scientists such as Gideon Mantell, William Buckland, and Sir Richard Owen, but their antique fossil discoveries didn’t thrill me a tenth as much as stumbling upon more Mary Anning tributes, including a complete Plesiosaurus skeleton discovered by Anning when she was 25. 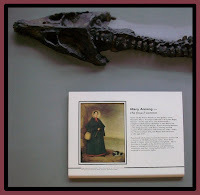 If, as Martin Luther King Jr. observed, the arc of the moral universe is long but bends toward justice, then Mary Anning is now justly receiving her due in 21st century British museums. History vindicates. 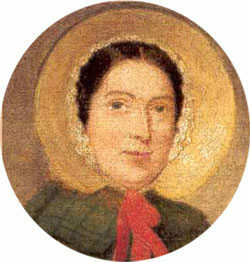 Mary Anning rules. with one of her discoveries: a Rhomaleosaurus. 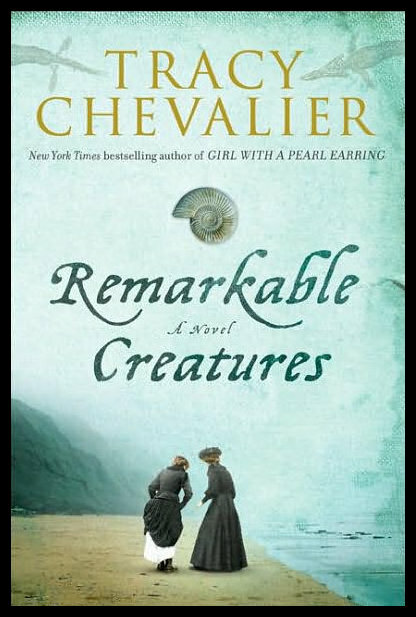 After we returned home and shared pictures of our trip on Facebook, a friend of my wife’s inquired if we knew about Remarkable Creatures, a recent novel by Tracy Chevalier, best-selling author of Girl With a Pearl Earring. Well, I’ve been reading about Mary Anning all my life, starting with my earliest dinosaur picture books, so I couldn’t resist. Remarkable Creatures is a fine addition to the Mary Anning legend and a fitting tribute to one of the 19th century’s most remarkable pioneers, who fearlessly ventured back into time along the rocky ledges of her little tourist town. Hwæt is an appropriate word to begin a read-aloud because—at least according to many scholars—it means something like, “Shut up, pay attention, this is important!” succinctly reduced to a single exclamatory command: Hwæt! It could be argued that English literature was launched with that one word. Once it was uttered, Chaucer, Shakespeare, Milton, Austen, Keats, Dickens, and Beowulf-scholar Tolkien would inevitably follow. A XV manuscript at the British Library. 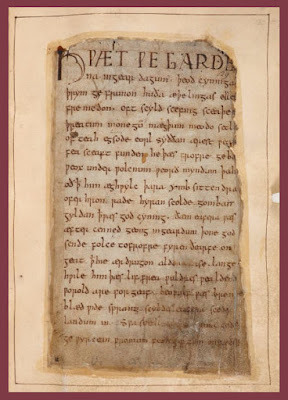 On my second day in London, I’m standing in front of the first leaf of the only existing manuscript of Beowulf, poised behind glass in the Sir John Ritblat Treasures of the British Library Gallery, the word Hwæt large in the left corner. 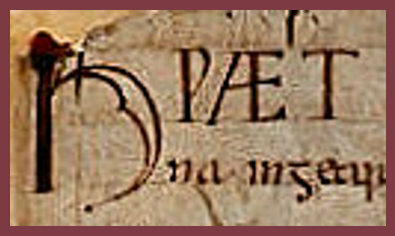 The penmanship was the work of some anonymous scribe, toiling in the late Anglo-Saxon world circa 1000 A.D., give or take a half-century either direction. Beowulf probably felt ancient even then, a mysterious relic of a marauding foreign mode of life. 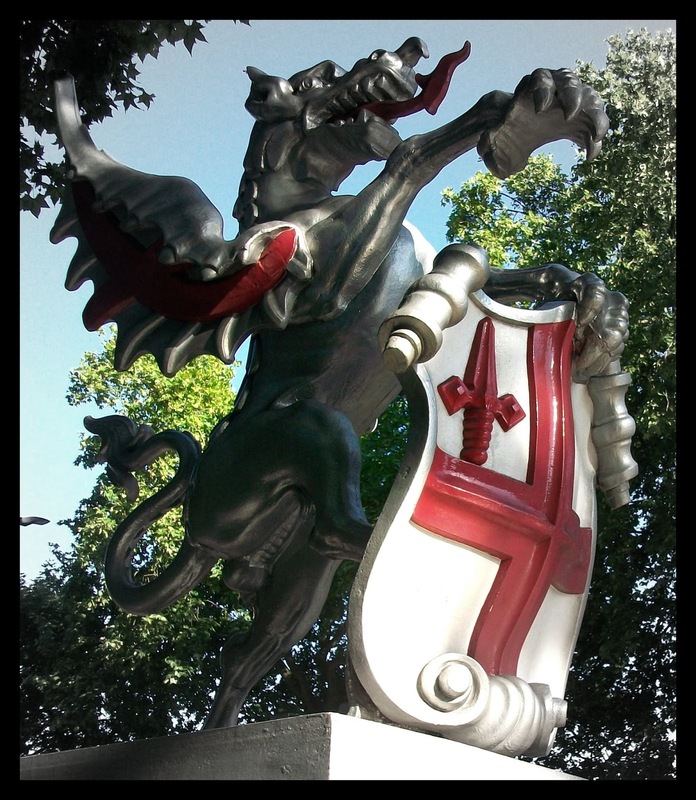 Today no one knows exactly what “Hwæt” means, the word apparently having dropped out of common usage as language shifted toward Middle English under the Norman occupation. By the time of Chaucer, no one was saying, “Hwæt,” not even the Wife of Bath. Conventional renderings of Hwæt, the first word of the poem, tend towards the archaic literary, with ‘lo,’ ‘hark,’ ‘behold,’ ‘attend,’ and—more colloquially—‘listen’ being some of the solutions offered previously. Of course, that would never have been the way the Beowulf poet would have declaimed it in in formal company, where certain poetic rules had to be observed. No, it’s the first draft that he improvised by the bed of his son, sharing a tale of Grendel beasts and dragons as the sun set and the shadows grew long. 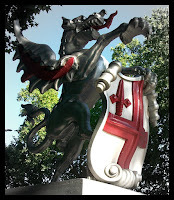 This entry is dedicated to Amy Heuer, my colleague at the Conservation Center for Art and Historic Artifacts, both because she loves Beowulf and also because she just graciously redesigned my 21 Essays banner, beautifully fine-tuning my beloved Leonardo da Vinci dragon! then please follow this link to make a donation to the National Film Preservation Foundation to support our effort to restore, score, and stream Cupid in Quarantine (1918), a one-reel silent comedy starring Elinor Field and Cullen Landis. Through this year’s science-fiction-themed blogathon, we’re trying to raise $10,000 and it's going to take many generous small (and large!) donations to get there. With great appreciation for your generosity, THANK YOU! in First Men in the Moon (1964). of Life and Death (1946). 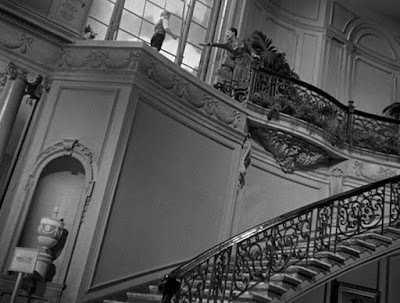 As the praise from Harryhausen would indicate, the production design of A Matter of Life and Death—particularly the celestial staircase—is sublime. In A Matter of Life and Death, the moving staircase is the connecting link between the worlds of life and death. It is a vast escalator in constant stately motion, lined by the statues of famous men. In the film’s design, where the afterlife is black-and-white and the earthly scenes are in Technicolor, the stairs are black-and-white when ascending and color when descending. Thus, this Jacob’s Ladder exists on the cusp of life and death. 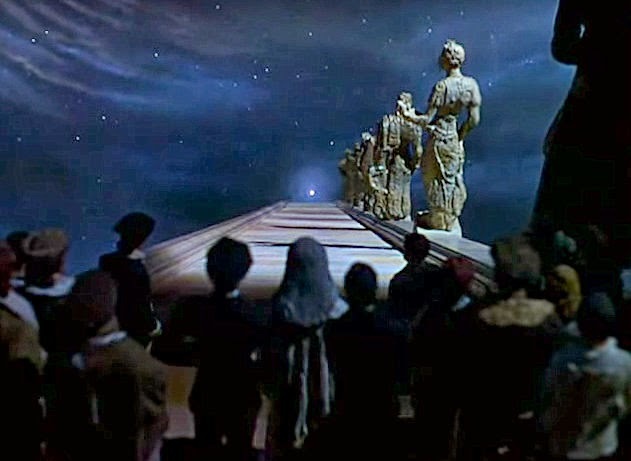 Harryhausen’s challenge to himself was to create a lunar staircase for First Men in the Moon to rival the grand design that legendary producers Michael Powell and Emeric Pressburger brought to A Matter of Life and Death. The result is formidable—Harryhausen’s lunar staircase is not as ethereal as the Life and Death staircase but entirely appropriate for an alien monarchy. Lined by impressive lunar crystals, the moon’s staircase proceeds upward in a series of four flights, cleverly combining miniatures and tricks of perspective to make the scale look enormous. 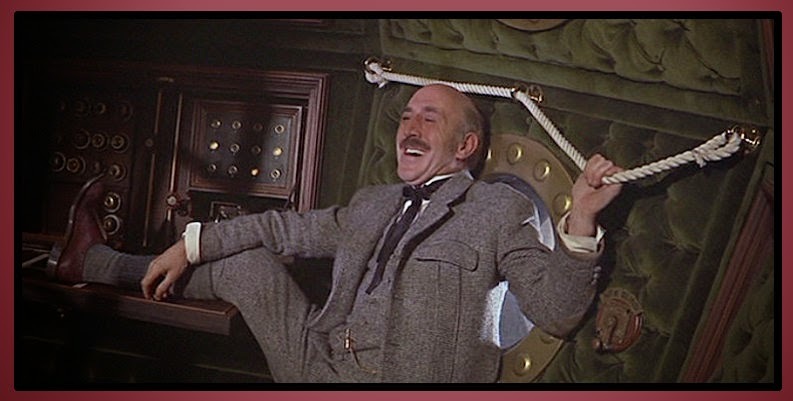 Lionel Jeffries as the brilliant Victorian scientist Joseph Cavor ascends the stairs alone, his character so delightfully delineated by the actor that he completely anchors the scene. From beginning to end, Jeffries’ performance is witty and unpredictable. His phrasing is deliciously staccato, swinging wildly between loveable insecurity and manic explosions. And it’s not just a verbal performance but a physical one, too, that allows Jeffries to use the awkwardness of his gangly frame to eccentric advantage. Cavor (Lionel Jeffries) inside the sphere in First Men in the Moon. As the movie proceeds, it gradually becomes apparent that Cavor is our real hero. He’s the heart and soul of the movie. So let’s look at him. His bald head disguises his real age, which is surprisingly young—Jeffries was 38 in 1964, two years younger than Martha Hyer who was playing the heroine. His smiles and guffaws are contagious, his delight expressed in unsuppressable childlike glee. He radiates eccentric amiability, quirky and British to the core. 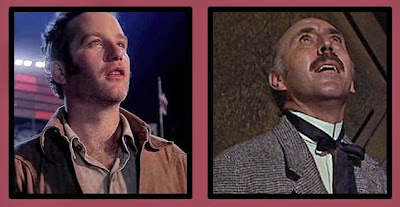 Did it occur to anyone during casting that this prematurely balding actor looks a bit like Ray Harryhausen? They share the long forehead, the narrow face, and the intense gaze of the consummate professional practicing his craft. And there’s something childlike about both of them, too, as if they’ve somehow managed to retain the enthusiasm of their youths. Why, Jeffries is the British doppelganger of the beloved animator! When Cavor ascends the staircase in First Men in the Moon, he is surrounded by one of the richest of Harryhausen’s dream landscapes, a Neverland of the artist’s imagination fueled by memories of the staircase to heaven in A Matter of Life and Death. Now squint at the screen, look sideways, out of the corner of your eye, and discreetly replace Cavor with Harryhausen, ascending to sublimity surrounded by an awe-inspiring world of his imagination. The look on Cavor’s face, dazzled and humbled and awestruck, reminds me of the recurring looks of wonderment in the movies of Steven Spielberg that filmmaker and critic Kevin B. Lee celebrated in his video essay The Spielberg Face. When you’re climbing the staircase of unfettered imagination, it is the only appropriate face. The Spielberg Face is the Cavor Face is the Harryhausen Face. The moment exceeds every expectation. Freeze frame on the Harryhausen Face. Lionel Jeffries in First Men in the Moon. Picture Ray on the grand staircase, ascending higher and higher, until he at last arrives at the celestial courtroom where he will be judged by a jury of his peers, among them Georges Melies, Wladyslaw Starewicz, John P. Fulton, Les Bowie, George Pal, Carlo Rambaldi, Stan Winston, Peter Ellenshaw, and Marcel Delgado. As he enters, the deafening applause washes across heaven like waves as his friends and fans stand to welcome him. Ray Bradbury smiles. And his old friend and mentor Willis O’Brien, animator of King Kong, rushes forward to greet him. staircase in A Matter of Life and Death. 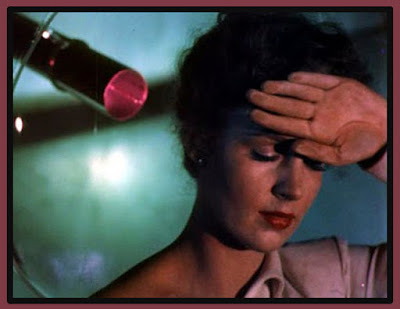 ... and a special thank you to the hosts of For the Love of Film: The Film Preservation Blogathon: Ferdy on Films, This Island Rod, and Wonders in the Dark. The great movie composers inevitably seem to get associated with one particular score—the one that would play behind them when they accept a Lifetime Achievement Award or receive an MBE from the Queen. For Max Steiner, it would be Gone With the Wind (1939). For Victor Young, The Quiet Man (1952). For Bernard Herrmann, Psycho (1960). Composer of the wonderful score of First Men in the Moon (1964), Laurie Johnson is forever tagged as the composer of The Avengers TV theme, the music that must have played behind him when he was awarded the MBE (Member of the Order of the British Empire) for his services to music in 2014. It’s one of the great TV themes. But there’s much more to Laurie Johnson than just The Avengers, case in point being his very fine score for First Men in the Moon. As the film moves from Victoriana to the weirdness of life insider the moon’s caverns, the music grows increasingly strange. In this first clip, the Selenites are introduced with a blast of dissonance which drops into a syncopation at the 26 second mark, effectively suggesting the movement of the Selenites along the cave passageways. Then a piercing high-pitched Selenite theme abruptly appears, eerily meshing keyboard with strings. Staccato brass echo the melody. From this point, whenever the Selenites approach, the theme returns. Surprisingly, First Men in the Moon only contains one traditional Harryhausen monster scene. The giant mooncalf provides this one opportunity for a chase and attack. Naturally, the mooncalf gets his own theme, both ponderous and relentless, echoing the beast’s size and threat. 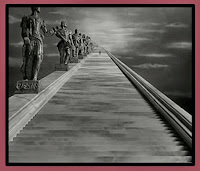 In one of the film’s most visually opulent scenes, designed by Harryhausen to suggest the magnificent sets of She (1935) and A Matter of Life and Death (1945), the scientist Joseph Cavor mounts a seemingly endless staircase that leads upward toward the throne of the Selenite ruler, the Grand Lunar. 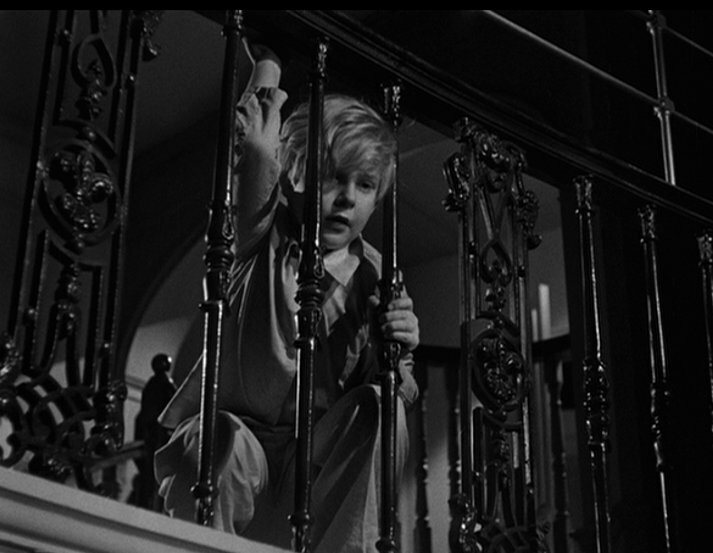 In this clip, Johnson’s staircase theme begins at 1:26, striking an almost religious note that appropriately reflects the look of awe on Cavor’s face. Now 88 years old, Laurie Johnson is one of the few members of the First Men in the Moon crew still with us. Over the years, he has scored more than 400 films and television episodes. Classically trained, he enjoyed adding experimental new sounds (like the synthesized Selenite theme) to traditional orchestral arrangements. You can hear his adventurousness in First Men in the Moon as he moves from Gustav Holst-style themes for Victorian England to a discreet background of electronica ever-murmuring behind the Selenites. It’s a magnificent piece of work. Captain Nemo (Herbert Lom) at the organ in Mysterious Island (1961). Considering how the Charles Schneer/Ray Harryhausen movies tend to coast on second-tier directors and actors, I’m always amazed that they so often invested in the very finest music composers. In return, Schneer and Harryhausen received scores that amplified the production values and technical effects, making the evocation of their fantasy worlds both more believable and dramatic. A great score helps a lot! For my three favorites scores to Harryhausen movies, it may appear that I’m picking one score apiece from three composers in order to avoid simply picking three Bernard Herrmann scores. After all, Herrmann’s musical reputation is stellar and ever-growing, and I have four excellent Herrmann scores to choose from (The Seventh Voyage of Sinbad, The Three Worlds of Gulliver, Mysterious Island, and Jason and the Argonauts). Also, I could be criticized for leaving out a fourth major composer—Miklos Rosza—who worked on the Harryhausen movie The Golden Voyage of Sinbad. But my selections really are my personal three favorites—the other Herrmann-scored movies would be in fourth through sixth place and, as for the Rosza score, I think it’s far from his best. My favorite of the Bernard Herrmann scores is his wonderfully varied work on Mysterious Island. It’s got swirling hurricane-evoking action music to launch the adventure, a set of moody quiet themes for the mysterious island, and quirky set pieces for each of the monsters. This selection—Elena/The Shadow/The Bird—begins with a delicate character piece for the young heroine, followed by some very Vertigo-esque forebodings, then (best of all) simultaneously comic and threatening music to accompany the attack of a giant flightless bird. The film composer Jerome Moross is justifiably most famous for his classic western score to The Big Country (1958). But—perhaps because I heard it first—my heart belongs to his music for The Valley of Gwangi, Harryhausen’s grand dino-western. This clip begins with introductory themes and then hits its stride at the 1:20 mark with one of the finest of all expansive western melodies. It’s everything I want a western score to be. And third favorite? Why that’s First Men in the Moon, of course! Composer Laurie Johnson, a friend and occasional assistant to Bernard Herrmann, seized the opportunity to do his own variation on a Herrmann-type score and he did the master proud.